Therapy Laser/Photobiomodulation Therapy is the technical term for Low Level Laser. It is a light therapy using lasers or LEDs to improve tissue repair, reduce pain and inflammation wherever the beam is applied. Inflammation is one of the scourges of your pet’s physical and mental health. Inflammation contributes to pain and a host of other chronic diseases. The most insidious aspect of inflammation is that your pet can “survive,” but definitely not thrive. Although applying direct red and infrared light to an inflamed area (i.e: injury) can be extra helpful, simple application to the body changes inflammatory markers in the blood. One study showed reduced numbers of pro-inflammatory cytokines (like TNF-a) in the blood after only 30 minutes. On average the inflammatory markers fell by 34, 12, and 1.5 times the normal amount. The red and near infrared therapy seems to really move the needle in terms of inflammation (these aren’t trivial amounts). 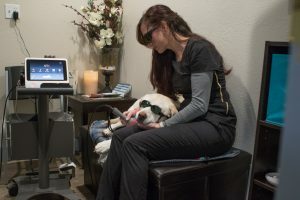 At Mountain View Animal Hospital & Holistic Pet Care, the laser is applied by a Veterinarian, Licensed Veterinary Technician or Nurse who has been specially trained in laser applications. The treatments take about 10 minutes to 20 minutes depending on how many sites are being treated and should be applied two or more times a week initially. Photobiomodulation has been used for many years on sports injuries, arthritic joints, neuropathic pain syndromes, back and neck pain. Over 300 randomized clinical trials have been published on Photobiomodulation, half of which are on pain. At Mountain View Animal Health & Holistic Pet Care we utilize the Companion Veterinary Laser. You can visit their website at http://www.litecure.com/companion/for-pet-owners/ for a host of information regarding Veterinary use of laser therapy, FAQ’s and videos. If you think that Laser/Photobiomodulation is right for your pet, please contact our office at 775-853-6002 to speak with our Holistic Veterinary Staff.